THURSDAY, Feb. 11, 2016 (HealthDay News) -- People 50 and older who have had recent asthma activity appear to be at an increased risk of abdominal aortic aneurysm, a new study suggests. An abdominal aortic aneurysm is a weak spot in the body's main artery, the aorta, where it passes through the abdomen. That weak spot can rupture, causing massive bleeding. 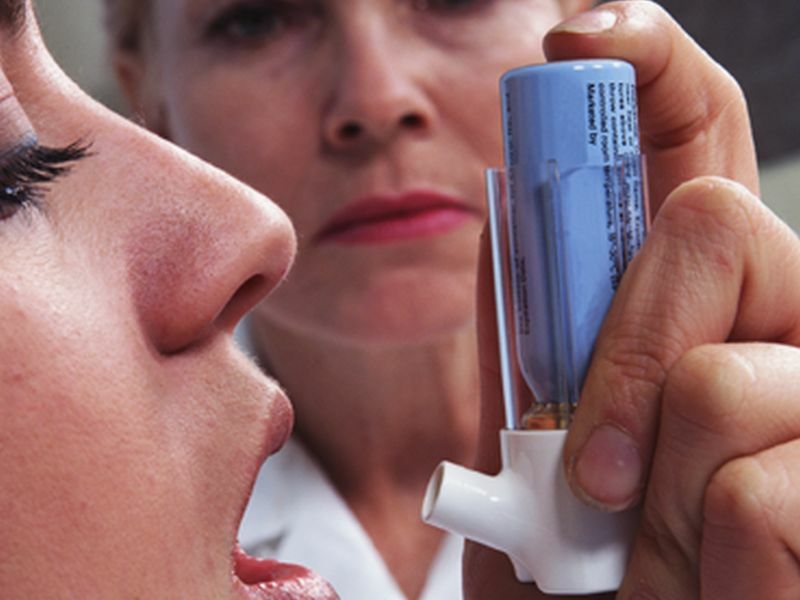 The researchers also found that people with recent asthma activity were more likely to have an aneurysm rupture compared to those without recent asthma activity. "People with abdominal aortic aneurysm who were diagnosed with asthma within the past year had more than a 50 percent greater risk of ruptured aneurysms than those without asthma," said lead researcher Guo-Ping Shi, from Brigham and Women's Hospital in Boston. Men diagnosed with asthma within the preceding six months were twice as likely to have an aortic aneurysm rupture, Shi said, adding that the risk was much lower among women. The researchers also found that use of anti-asthmatic medication in the last six months was linked to a 45 percent raised risk of an abdominal aortic aneurysm. Shi cautioned that the study only shows an association between asthma, aneurysm and rupture; it doesn't prove that asthma causes aneurysm or the rupture of an aneurysm. The study was published online Feb. 11 in the journal Arteriosclerosis, Thrombosis and Vascular Biology. Abdominal aortic aneurysm is more likely to occur in older men who have other risk factors, such as smoking, high blood pressure, high cholesterol, obesity and emphysema, Shi said. The aorta carries blood to the whole body. When it becomes weakened it can form a balloon-like bulge that may rupture, he said. Because an abdominal aortic aneurysm rupture can be deadly, Shi recommended that men 50 and older with asthma be checked for aneurysms. This can be done with a noninvasive ultrasound. And, if necessary, an aneurysm can be fixed with an operation, Shi said. According to Dr. Len Horovitz, a pulmonologist at Lenox Hill Hospital in New York City, "If you have asthma and doubts about whether you have an aneurysm, you can have an abdominal ultrasound. It's easy and noninvasive." For the study, Shi and his colleagues collected data from two national health registries in Denmark. One had information on nearly 16,000 men and women aged 50 and older. About 4,500 of the adults in this group had an abdominal aortic aneurysm, the study said. The second registry had information on 619 people with abdominal aortic aneurysm, along with information on smoking status. Shi said the most likely culprit behind the association is a specific inflammation-related protein called IgE, or immunoglobulin E, which the body makes in response to allergens. IgE makes arteries stiff, which can lead to aneurysm, Shi said. If IgE is the culprit, the risk for an aneurysm wouldn't be confined to asthma, but would include allergies and other allergic diseases, too, because these conditions cause levels of IgE to increase. The connection between asthma and aneurysm was first seen in animal studies. Mice with asthma developed aortic aneurysms twice as large as those without the disease, Shi said. Dr. Gregg Fonarow, a professor of cardiovascular medicine and science at the University of California, Los Angeles, said, "Asthma involves inflammatory mechanisms, including mast cells and IgE, and effective treatment of asthma has long involved therapies that target inflammation." Recent studies have found that mast cells and IgE can be found in abdominal aortic aneurysms, he said. "This study provides additional evidence suggesting that inflammation is playing a role in abdominal aortic aneurysms and it may open new lines of research into potential therapies to prevent the development and rupture of abdominal aortic aneurysms," Fonarow said.